embarrassing if it were wrong by some order of magnitude. 10 or 16 make sense. But are they correct? 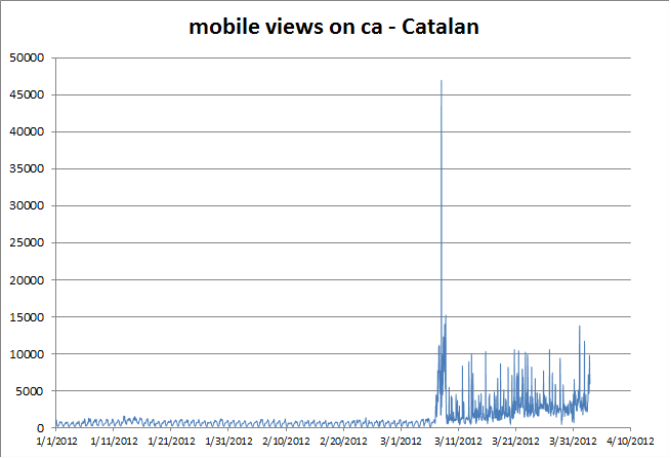 Swedish Wikisource could attract even this much traffic. day's logfile with 13,000 lines is realistic for a human. and accesses to non-pages (like images and style sheets). however 9 of these are bots!! projectcounts files (at the source : webstatscollector) last week. where it wasn't years ago. There is of course a difference between the language and the country. 13,000 lines is realistic for a human. crawlers and accesses to non-pages (like images and style sheets). and non-contributors, and present page views from each category? > however 9 of these are bots!! How many of that 1000 sample log were robots (including all languages)? >> however 9 of these are bots!! even though it is similar to our main site). Here is a random example of how our traffic on smaller Wikipedias changed. In the 1:1000 sampled squid log we should find ~47 of those. "zcat sampled-1000.log-20120308.gz | grep ca.m.wikipedia.org"
yields 339 records for the whole day, most are Google bot. > some reason like this. b) sites in languages with a smaller audience (Swedish sites). background noise, and the human traffic is the signal on top. visited pages is drowning in that noise. views per day or 1/4 of that web traffic, I'd be surprised. It is more likely that 71/116 = 61% is bot traffic. the author claims it's 20x faster. present discard the logline and else process as-is.